Croydon Natural History & Scientific Society is therefore one of the oldest cultural societies operating in Croydon. 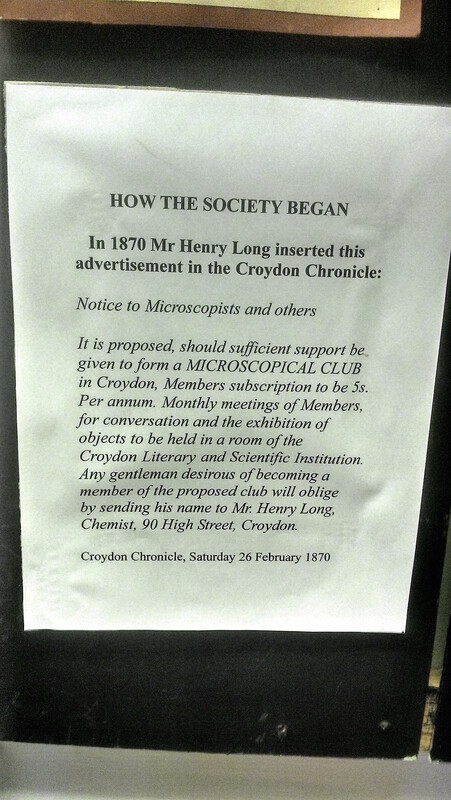 It traces its history continuously from the Croydon Microscopical Club (1870–1877), through the Croydon Microscopical and Natural History Club (1877–1901), and became Croydon Natural History and Scientific Society in 1902. It was incorporated as a company on 14 November 1967, and registered as a charity on 2 March 1970. For the public benefit, to encourage the study of the sciences, especially the natural and local history and archaeology of the Croydon area, by organising lectures, members’ talks, discussions, exhibitions, field meetings and surveys, by issuing publications, and by maintaining a library and a museum. The Society is concerned with original investigation, conservation, recording, curation, education, and incidental recreation. Unless otherwise stated, indoor meetings are held in the Small Hall of the East Croydon United Reformed Church, Addiscombe Grove, almost opposite East Croydon Station, at 7.45pm. If you are not a member of the Society, you are still very welcome at our talks, walks and other events, unless they are specifically advertised as members only. If you do come, we would encourage you to make a small donation to help us cover our costs – we suggest £2 – but it is not at all compulsory. The Society’s own museum and library may be visited by arrangement with the curator and librarian respectively (see the Directory). Volunteers willing to help with cataloguing the geological and archaeological collection are welcome. Members may borrow books from the library. The group is an informal part of the society as it does not have a section secretary but it remains active, meeting at least twice a month at various birding sites near and far, for example, at South Norwood Country Park, Beddington Park, the Oare marshes in Kent and Pagham harbour in Sussex. Details can be obtained from the General Secretary who will send you a programme of the excursions. It is necessary to inform the leader of each excursion in advance to let him or her know you are going. The place of meeting is always the venue. There are no indoor meetings apart from when the programme of outings is planned. Graham Collins is the Section Secretary and meetings are held at the East Croydon United Reformed Church in one of the smaller rooms. The meetings are informal insofar as there are no invited speakers. Members bring along specimens they have found or photographs they have taken of insects for the purpose of either identification or discussion or both. Members sometimes bring along equipment. There are no excursions but this does not rule out going outside.